A Docker image is a file system that wraps up your software or analysis pipeline. The image is a collection of all of the files that make up the app, and each change to the original image is stored as a separate layer. Each time you commit to a docker image, you are creating a new layer on the docker image, but the original image and each layer remain unchanged. Docker images are essentially a snapshot of a container. Images are created with the build command, and they'll produce a container when started with run. Images are stored in a Docker Hub. Managing and working with images locally on your Docker host. Uploading images to Docker Hub Registry. Ubuntu-14.04 with Docker installed on your system. You can list the all images that are available on the Docker host by running the docker images subcommand. The default docker images will show all top level images, their repository and tags, and their size. In the above output, you can see five items in the preceding listing. REPOSITORY:- This is the name of the repository or image. TAG:- This is the tag associated with the image. IMAGE ID:- This is the image ID of each image. Every image is associated with a unique ID . CREATED:- This is the time when the image was created. SIZE:- This is the size of the image. Docker will automatically download any image that is not present on the Docker host system. You can see that each layer of the image has been pulled down. Now, you can run a container from this image and you won't have to wait to download the image. One of the most important features of Docker is that a lot of people have created Docker images for a variety of purposes. Many of these have been uploaded to Docker Hub. The Docker Hub repository typically hosts both the official images as well as the images that have been uploaded by the third-party Docker enthusiasts. You can easily search for the Docker images in the Docker Hub Registry by using the docker search subcommand. You can see that the output returns lot of images related to apache. The images are ordered based on their star rating. The search result also indicates whether or not the image is official. Here, you can see the apache tomcat image, which pulls a 496 star rating image as its first result. The third result shows that this version of the apache image was published by the user aboraas. If you would like to make changes to an image, then you will need to create a container from the image. Now, install some packages inside container such as apache, wget and nano, then commit changes to the image. The Docker Hub is a central place used for keeping the Docker images in a public or private repository. This allows you to host its image online and share it publicly or keep it private. The Docker Hub provides many features, such as a repository for Docker images, user authentications, automated image builds, integration with GitHub and managing organisations and groups. In order to work with the Docker Hub, you will need to Create an account on Docker Hub, Log in to the hub on your Docker host and Push your image to Docker Hub. You can create an account using the URL https://hub.docker.com/account/signup. After verifying the email address that you used to create the account, your registration will be complete. This free account will allow you to publish public images as well as have one private repository. 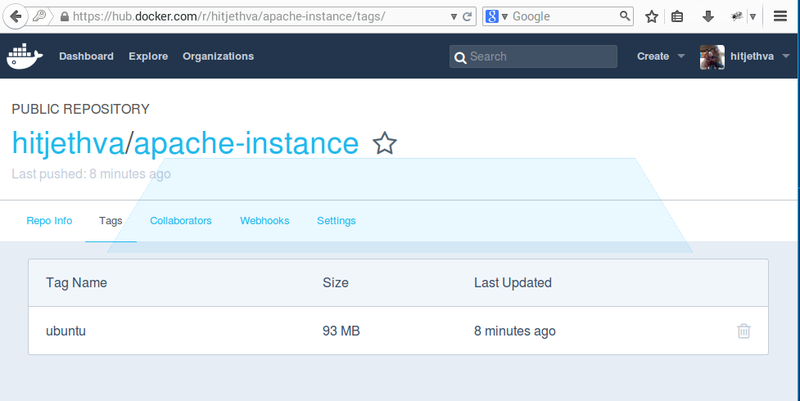 Before pushing an image to Docker Hub, you will need to tag the apache-instance image. Note: 7da78270c5f7 is the image id of the apache-instance image, ubuntu is the image tag and hitjethva is your account name on Docker Hub. I hope you now have enough knowledge of how to create your own docker image with the necessary changes and push it on Docker Hub. You can also experiment with the above tutorial by setting up virtual environment.